I finally bought a bow! My very own and very first so I thought I’d share the experience. I first started shooting in October 2012. I contemplated buying a bow in December but just before I planned to go shopping I went on vacation. When I got back I felt a bit like I was starting all over again. After a couple more useful months of practice (in February 2013), I realised that I was still shooting the 18lb club traIning bow. As I’d been practicing for around 5 months at this point I felt that I could probably manage something a little heavier. So each week I pushed myself a little and in three sessions I moved from 18 to 26lb (still using 2020 Archery bows)! At the same time as I was increasing the poundage of the bow I started to gather information about equipment to try and make myself look like a knowledgeable buyer and mask (at least some of) my ignorance. So, on a sunny Saturday in March I set off to my nearest archery shop. A number of people had suggested that I should try out different risers so this was my plan. However, once I got to the store I discovered that there were only two risers within my budget (having a budget makes life far simpler). 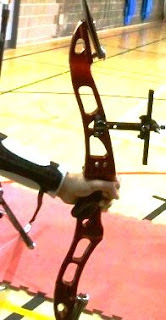 The first riser that I tried was pretty awesome, and felt much heavier than the wooden club bow. By the time I tried the second one I was super tired from practicing with the first so it seemed heavier – despite the sales girl insisting that it was in fact lighter than the previous one. Even with the extra weight I thought that the second bow was pretty awesome as well! I basically couldn’t tell the difference at all. Except that the more expensive one was prettier to look at. I thought for a bit… and then thought a bit more… and then decided to buy the pretty one! So I ended up with a beautiful red Hoyt Horizon riser and 26lb SF Premium limbs to go with it. I did buy an entire kit, mostly going for the cheaper options where possible. In total I came out with the bow plus 8 Jazz arrows with red/white fletchings, a basic sight, bow-stand, quiver, arm guard, finger tab, arrow puller and bow-stringer. I also bought a backpack as I can’t possibly carry it all without one. Most people told me that the whole thing would take about 3 hours, but I reckon that I did it in only about 30mins! I was really eager to try it the next day, but as always seems to happen when I get very excited about something, bad luck followed and I woke up with flu. I had to wait an entire week before I could use my new kit. I turned up to the practice session at my usual time and found that It took me a good quarter of an hour just to fix everything together! I also made a good many mistakes as I did so and required a bit of help! Eventually I managed to get started and it then took me the next half of the session to nail down the sight marks. At this point I realised that shooting a club bow was a lot easier! My second attempt was much better. I set up my kit in roughly 10 minutes – and managed to do it completely on my own without help. I also learnt that there is an upper limb and a lower limb and that they are not interchangeable! Ahem. I’m now gradually getting to the point where I feel like the bow is right for me and its starting to feel like mine. Just as important as this is learning how to take care of it properly and – easier this one – learning to love it! Nice choice. When I bought my recurve I was going to buy the Horizon, but with all the other equipment it didn’t fit into my budget, so I went for the similar Hoyt Excel instead. Which shop was it?